Under this section you can name your website and give caption to your site, show or hide components like logo, sidebar and breadcrumbs to your visitors. You can also upload a custom favicon for your website. Using a password, you can now restrict access to any page on your website. Refer to Password Protection page for details. The purpose of favicon customization is rebranding, and is limited to Pro plan. Supported formats are jpg, png and ico. The optimum size of the favicon is 16x16, 32x32, 64x64 pixels. Zoho Sites provides the option to download your website in a zip format. 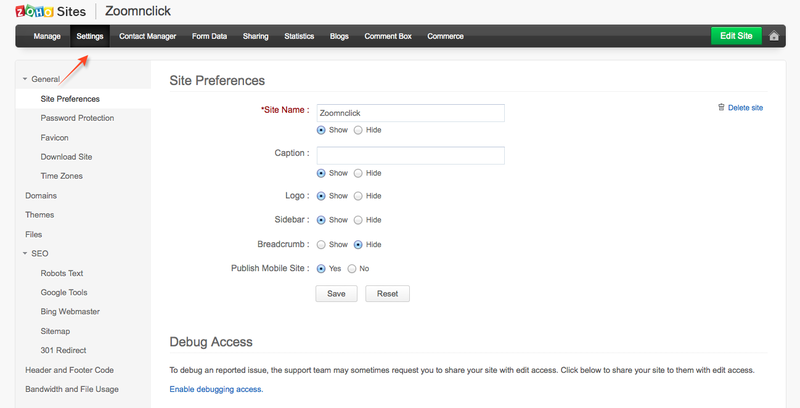 To download your site, go to the settings page and click on Request Download button. Once the download request is received, you would receive a confirmation on your screen indicating the same. Once your request is completed, the link to download your site will be available right in the download site screen. You have the option to set time zone for your website. This timezone comes into picture when you are using the comment box feature and scheduling a blog post. A domain is the unique URL on the browser's address bar through which users can access your site. The domain you pick can be your own domain e.g. 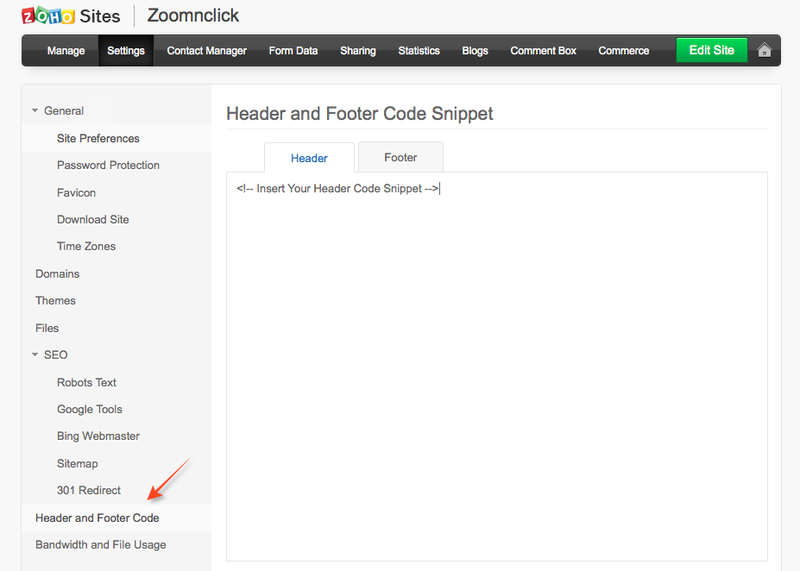 zoomnclick.in or a free subdomain of Zoho Sites, e.g. zoomnclick.zohosites.com. Own domain can be registered with Zoho Sites at the time of publishing your site. If you already have purchased it elsewhere, you can just map that. Refer to domain mapping for details. There are two ways of creating your website in Zoho site builder. 1. Create a website from scratch. 2. Create a website by uploading your own HTML/CSS files. 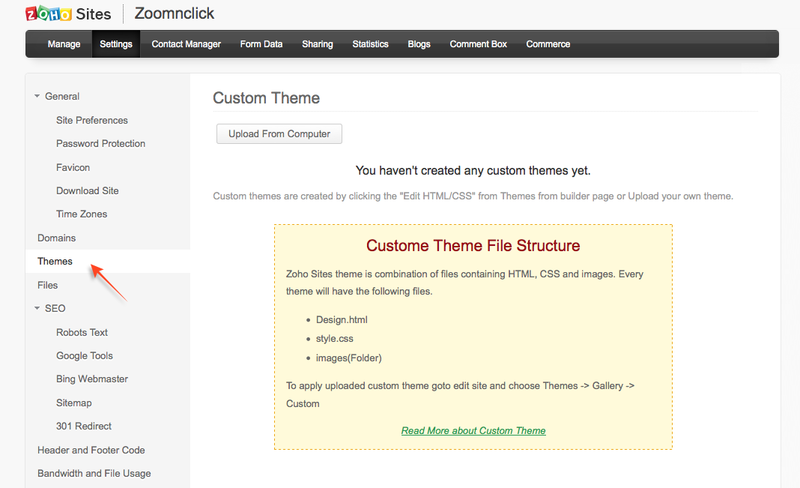 To upload your own HTML/CSS files, go to Settings > Themes, click on 'Upload from Computer' button and upload your file to the Zoho site builder. The Zoho theme that you customize in the site builder will also be listed on this Custom Theme page, which you could rename, edit or delete. The file manager is a universal repository for your site. You can upload all the files you would need on that site, and then insert them wherever needed. The files uploaded are site-specific, which means you cannot access the same files on your other sites. You can analyze the type of visitors your website gets every day, where they arrive at your website, where they quit, and more minute details like which part of your website they react to. For these in-depth analysis, you can configure Google Analytics account for your domain. Set up an account with Google Analytics, and use the unique identifier code in the GA Tracker ID field. This will link your website with your Google Analytics account. To make your site visible to the search engines, you need to get your site verified with Google Webmaster Tools. Sign in to Google Webmaster Tools with your Google account. (Sign up, if you don't have one). Click "Add a site", enter the domain name of your site in the box that pops up, then click "Continue." Your will be taken to another page. In that page click the alternative method tab and select the radio button labeled as HTML tag. Copy the meta tag (for example,<meta name="google-site-verification", content="-CrQ_DrWlnmxXAAUWPbBMs3XnqzCi9yOA8DV66UuTsk" /> ) from the Instruction box. In a new browser window or tab, sign in into sites.zoho.com, click on Settings > Google Tools and.paste the meta tag that you copied, in the text box labeled as Meta Tag. Click Save and re-publish your site now. Make sure you copy only the content value from the meta tag. Go back to the Webmaster Tools page from where you got the meta tag and click the "Verify" button. Your site will now get verified. Similar to verifying your site with Google Webmaster, you may also verify your site with Bing Webmaster. Copy and paste the meta tag that you get from Bing Webmaster in the Meta Tag text box in Bing Webmaster screen. We provide easy way of creating sitemap.xml for search engines to crawl the pages with the settings you add. You can also set priority level for each page and change the frequency value. Note: Priority and frequency setting are not specific to Zoho Sites. This can be decided by the search engines too. The priority lets the search engines know which pages you seem most important for the crawlers. Search engines may use this information when selecting between URLs on the same site, so you can use this tag to increase the possiblility of very important pages to be present in a search index. Note: Assigning a high priority to all of the URLs on your site is not likely to help you. Since the priority is relative, it is only used to select between URLs on your site. Frequency value provides general information to search engines and may not correlate exactly as to how often they crawl the page. The frequency value always should be used to describe documents that change each time they are accessed. The value never should be used to describe archived URLs. Note: The value of this tag is considered a hint and not a command. Even though search engine crawlers may consider this information when making decisions, they may crawl pages marked "hourly" less frequently than that, and they may crawl pages marked "yearly" more frequently than that. Crawlers may periodically crawl pages marked "never" so that they can handle unexpected changes to those pages. 301 Redirect is a permanent redirect status indicating that the resource has moved permanently. The most efficient and search engine friendly method for redirecting webpages is 301 re-direction. It is pretty simple to use and it would preserve your search engine rankings for that particular page. The code "301" is interpreted as moved permanently. All you need to do is enter the request and destination URLs and save the changes. If you would like to add scripts to the header or footer section of your website, go to Settings > Header and Footer code, choose the Header or Footer tab, add the code, save it and re-publish your website for the changes to take effect. Scripts added to the website's header or footer do not appear to visitors. 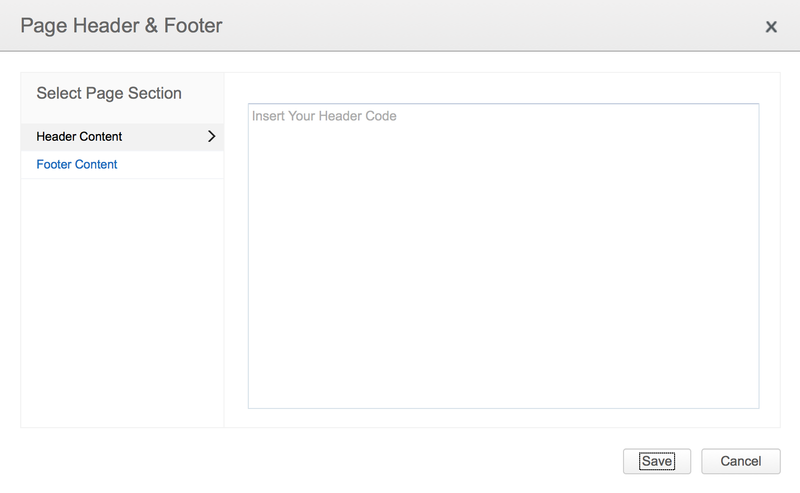 You can now add page-specific headers and footers on your website. For example, to add a chat box to the Contact page on your website you can add a header and footer code in the Contact page alone. This feature is designed to allow you to seamlessly integrate with third party apps. To add third party widgets to your website, header and footer codes need to be obtained from the third party websites. To add the codes, here's what you need to do: Navigate to that page, go to Page Options, click on Page Header & Footer, and insert your header or footer code for that page. You have the option to keep a track of the bandwidth and file usage in your website Zoho site builder. Click on Bandwidth and File Usage in the Settings screen to access the data.